I am actually trying to fix my remote control. I checked on the oscilloscope and I see more than one burst but they are sepate 3.9ms and only 950mV amplitude. Any idea what the problem could be? Could the IR Led be broken, the uC or the capacitors? 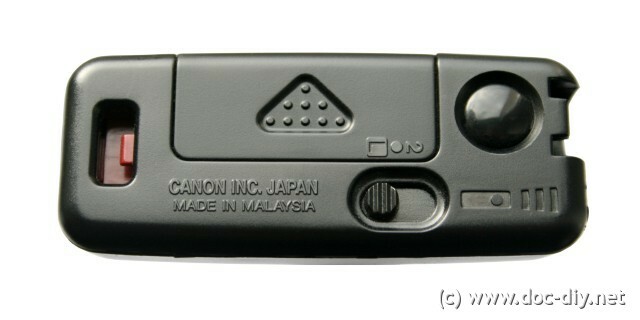 who know IR pulse for canon RC-5 remote control? I have a canon eos 550D.Tks. I guess the remote control will also work with the caps behind the switch. In this case you will allways loose the energy stored in the caps after disconnecting them due to the uC standby current. I didn't estimate whether the loss is bigger than in case of the caps constantly connected. In both version the batteries should hold for many years. Why are the capacitators powered even if the button isn't pressed? They are wasting energy in that configuration all the time. 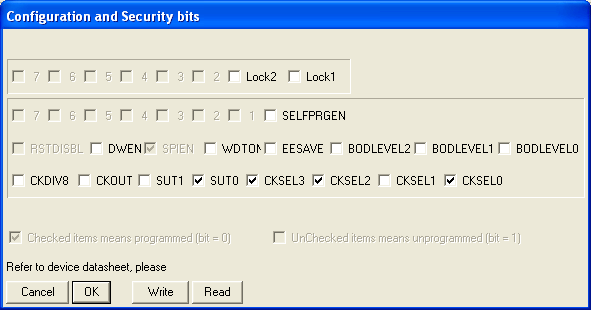 The hex file and the source code are for the simple version. In the initial version I used a crystal to get an exact clock. I modifed the text in a few places to clarify what is what. Is the simple circuit also working with the hexfile? Why are you using an external crystal oscillator? I need asm code for ATtiny13. Very nice and useful project, I mostly use PIC, can somebody send the hex code for it please. - I use a while(1) loop within main() to perform several trigger attempts with 100ms delays, should one of them fail. - The buffer cap can be eliminated, according to my experiences, the CR2032 can provide enough power. My version consists of only a battery, switches, Attiny45, and a led with a resistor. I would like to put your PIC asm code on the page above if it's ok for you. Please contact me per e-mail if you want. You can find the address in the 'About' section of the page. Great job! Thanks a lot. I tried 940nm diode and it worked as well. I can also offer asm code for PIC 16F628A if anybody is interested.